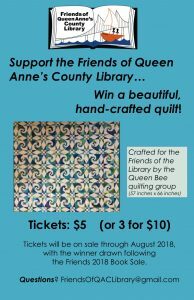 The Friends of Queen Anne’s County Library will be selling raffle tickets for the chance to win a beautiful hand-made quilt. Pieced and quilted by a local Queen Anne’s County quilt bee, the 57 inch x 66 inch quilt includes a mix of blue, green, and white fabrics in an intricate design that would look stunning in any home. Tickets cost $5, or 3 for $10. The grand-prize winner will be selected following the Friends’ Annual Book Sale in August 2018. See more from the Bay Times.